Timbers Kovar is your trusted service center to get your dock door operational. We have the parts and qualified service technicians to take care of any commercial door problem. We can repair high speed doors, impact doors, sectional and rolling steel doors. 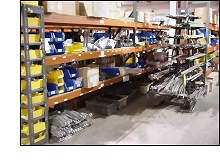 We carry many hard to find parts.